As we begin a new school year, I want to welcome everyone to UC San Diego – new and returning students, faculty and staff – and take this opportunity to share some of our recent rankings with you, which may have been missed in the fun-filled days of summer. Money Magazine named us the No. 2 school in the U.S. for gaining a quality education at an affordable price and transforming the lives of low-income students. 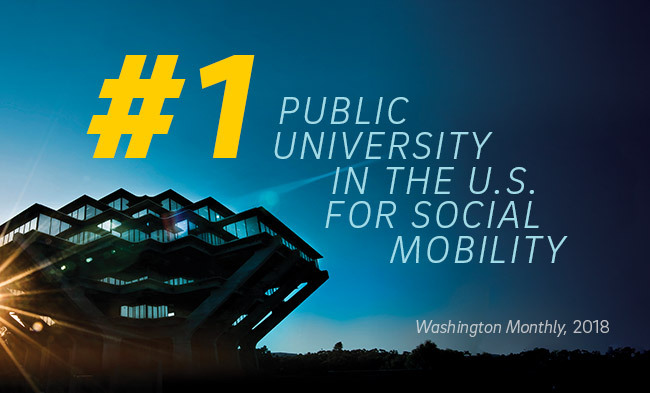 And, Washington Monthly has once again named UC San Diego the best public university in the nation for contributions to social mobility, research and public service. We were also recognized as a top global university for research and ranked nationally for our Health enterprise. You can read more about these rankings below. I hope you will be as pleased and proud as I am about the transformative education, research and service opportunities UC San Diego provides. We could not do this without the many contributions of our faculty, staff and students. Thank you for all you do, and will continue to do, to change our world for the better.